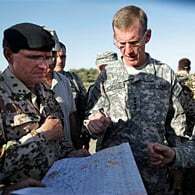 Embedded in General Stanley McChrystal’s classified assessment of the war in Afghanistan is his conclusion that a successful counterinsurgency strategy will require 500,000 troops over five years. There are perhaps only two people in America who think that this level of commitment is sustainable by the United States and its allies, and they left office last January. * 2009 is already the deadliest year for U.S. forces since the war began eight years ago. Fifty-one of the seven hundred and thirty eight U.S. soldiers who have lost their lives in Afghanistan were killed last month alone. * The national Afghanistan election that Ambassador Karl Eikenberry hoped would lead to a “renewal of trust of the Afghan people for their government” was a disaster and has had the opposite effect. The European Union election monitor has found that over 1 million votes for President Karzai, one third of his total, may be fraudulent. General McChrystal himself describes the Afghanistan government as “riddled with corruption”. A government already mired in allegations of widespread fraud and corruption, now facing serious charges and compelling evidence that it has attempted to steal the national election, has no hope of regaining the support of the people of Afghanistan. * A February 2009 ABC/BBC/ARD poll found that only 18 percent of Afghans support increasing the number of U.S. troops in their country. This should come as no surprise. Historically, Afghans have always forcefully resisted the presence of foreign military forces, be they British, Soviet or American. * The presence of foreign forces strengthens the hand of Taliban recruiters. An independent analysis early this year by the Carnegie Institute concluded that the presence of foreign troops is probably the single most important factor in the resurgence of the Taliban. Would you prefer to have a president who doesn’t shift strategy when he gets this kind of ground troop from the commanders? Right question. And the answer is: NO! Congress should immediately convene hearings to discuss alternatives to General McChrystal’s proposal for such a massive escalation of the war in Afghanistan. It is time for the administration and Congress to demilitarize U.S. policy in Afghanistan and strike out in a new, sustainable, direction.